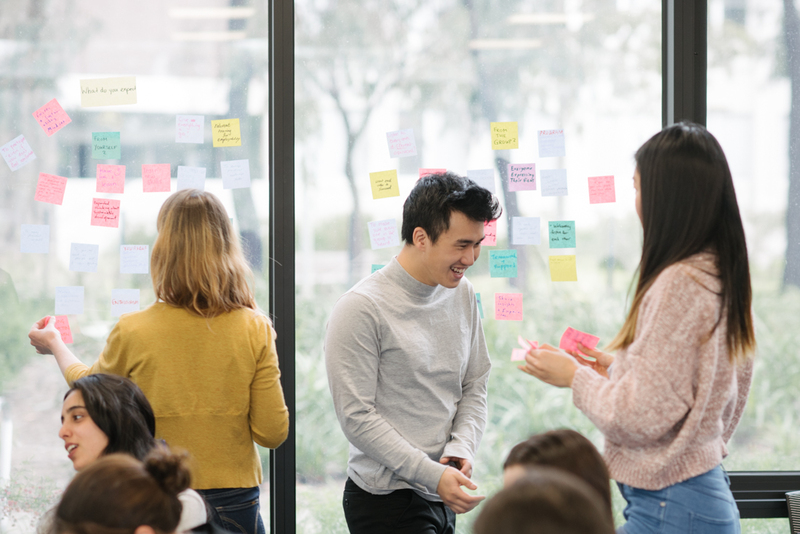 Then apply for Green Steps, a transformational sustainability leadership program at Monash University, equipping students with the skills, tools and knowledge needed to become effective leaders and sustainability change agents. Green Steps is an award-winning sustainability leadership program run by Monash Sustainable Development Institute. The program offers innovative and practical sustainability training and consultancy projects for ambitious emerging leaders at Monash University. Over the past 17 years, the extra-curricular program has transformed lives, launched careers and most importantly, created a network of leaders who are now working in organisations to make the world a more sustainable place to live. Each year we offer 30 fully-funded places to selected Monash students from across a diverse range of faculties and disciplines. As part of the program, students will gain the skills and knowledge to transform attitudes and drive change for a more just, sustainable and resilient world. [Green steps] is a fantastic course. I gained a lot of great skills that I look forward to applying, not only in the sustainability context, but also in my life." 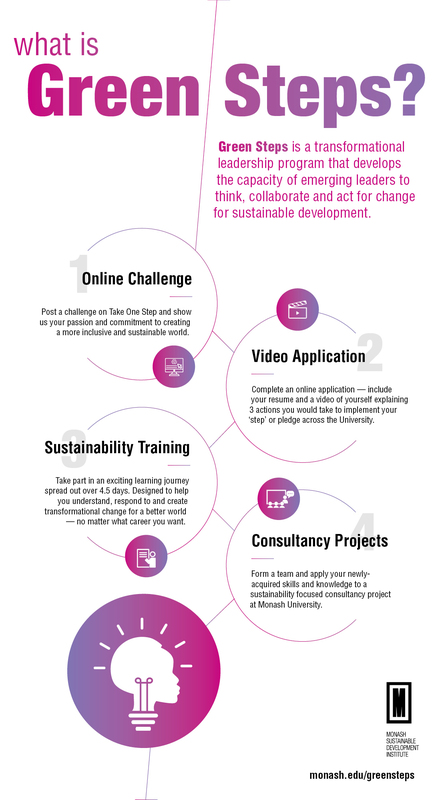 Online sustainability challenge: As part of the application process, you’ll take part in Take One Step, an online platform that challenges you to take an action towards sustainability. Once you've posted a step, we'll also ask you to submit an application form, with a short video of yourself. Training: Selected students will participate in five days of hands-on sustainability training across two weekends. The five day training, spread over several weeks, draws on expertise and guest speakers from across Monash Sustainable Development Institute, including from ClimateWorks, BehaviourWorks and the Oxfam-Monash Partnership. We'll begin with an overview of global (macro) sustainability challenges through the lens of the United Nations Sustainable Development Goals, followed by a deeper exploration of two major sustainability issues: climate change and inequality. We'll then look at how sustainability is applied within organisations (meso), and develop your individual leadership capabilities (micro) to effectively promote and lead sustainable change. The training component also includes a visit to the site of Monash’s Net Zero Initiative, the University’s ambitious program to have our Australian campuses using 100 per cent renewable power and net zero emissions by 2030. 1). Sign up for the Take One Step challenge, and commit to live more sustainably. 2). Prepare a 60–90 second video presenting three ways you’ll roll out your Take One Step pledge across the University. 3). Upload your application, complete with resume and video, via the application form before midnight on Monday 18 March. Be creative. We're looking for students (and 'Steps') that think outside the box. Take a look at UN Sustainable Development Goals and consider how you might align your action with a target or indicator (either economic, social or environmental). Please read the Take One Step User Guideto help with creating an account and using the platform. We'll also ask you to submit a video of yourself with your application, explaining three actions you would take to implement your ‘step’ or pledge across Monash University. Check out this guide on how to shoot an effective video. When filming your video, make sure you reference your step on Take One Step and explain how it might be applied as a campaign or set of activities across Monash. Green Steps is open to all current Monash University students however preference is given to students in their final years of study. The program is run once a year at both Monash University (Clayton) and Monash University Malaysia. FREE - applicants must first participate in Take One Step, an online platform inviting participants to commit to a sustainability-related action before they go through the selection process to gain a place on the program. Green Steps training style is unlike any university course. We encourage engagement, collaboration and above all, a fun approach to learning new skills. The training combines critical inquiry and pragmatic tools with insights from sustainability experts and entrepreneurial practice. It’s highly interactive and is focused on teamwork and group discussion. You’ll be learning from our highly experienced trainers, guest speakers and other participants from a range of study areas. "The style is unlike anything you get in a regular uni class. It is so engaging, respectful, welcoming and informative. I immediately felt comfortable in the group." To apply, you must be available to attend training on all days specified in the listed training dates. It is your responsibility to cancel, swap or take leave from any lectures, tutorials, work and extracurricular commitments during this time. Some preparation is also required between training blocks. Depending on the program, your availability and interest, you may also apply for a sustainability consultancy role with Monash University's Office of Environment and Sustainability. Repeatedly we hear from alumni that Green Steps is one of the most valuable things they did while they were at university. However it's worth keeping in mind that Green Steps is a challenging program. Firstly, training is intensive, with lots of small group activities and group discussions where you’ll be expected to stretch yourself and contribute as much as possible. Secondly, and most importantly, Green Steps is demanding of your outlook, requiring goodwill and openness to the content, trainers and fellow participants. Green Steps was created in 2000 by a group of students who wanted their peers to gain the skills needed to make sustainability-related change in the organisations they will one day work for. Across five days of group-based training sessions, Green Steps gives students practical skills and knowledge which they're then able apply to a multi-disciplinary team based consultancy project. Our program has been recognised with several prestigious awards, including the Premier's Sustainability Award, the United Nations Association Education Award and the Banksia Environmental Award. If you have any questions please contact msdi-education@monash.edu.